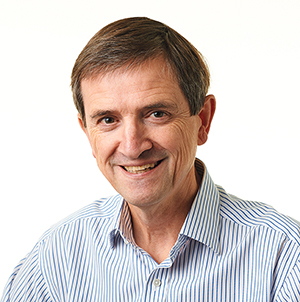 Residents on the outskirts of Clonlara, who have been left marooned by rising flood waters, have urged Agriculture Minister not to forget them ahead of Tuesday’s Cabinet meeting. 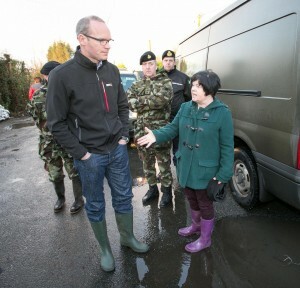 Minister Coveney visited some residents in a flat bottom boat with the help of the Irish Defence Forces early on Sunday morning. 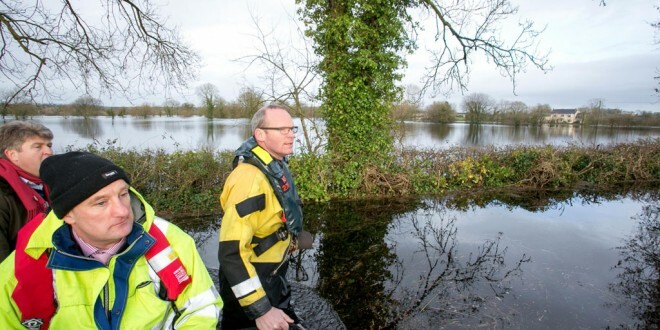 The Cork Deputy, who was the first government representative to visit the devastated community, since it began to flood nearly a month ago, spoke to householders, who are cut off from their homes due to the flooding of a local access road. John Mason meets Minister Simon Coveney and Michael McNamara TD in Springfield, Clonlara. Photography by Arthur Ellis. Standing with the minister in the river of water surrounding her home, resident, Lisa Griffin asked the minister to save the community from the regular incidence of flooding, which first started in 1995. When the ESB-operated Parteen Weir reaches capacity, the company releases excess volumes of water, which in turn results in Springfield and the wider Clonlara area becoming flooded. 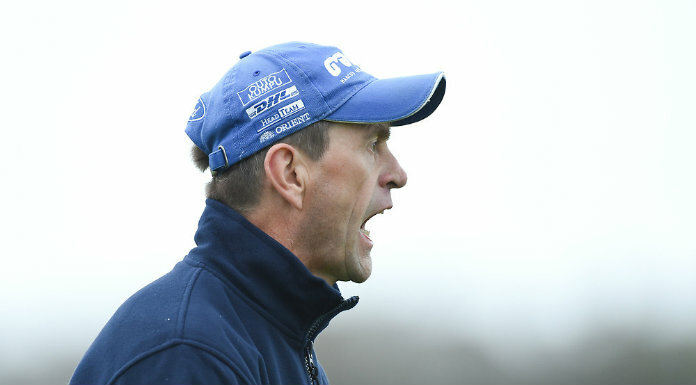 “If you are going to protect Athlone you are going to wash us away,” Ms Griffin told Minister Coveney. “We are badly effected. You are going to see it when you go down that road and (the water) is above your waist,” she said. “We don’t want to be forgotten about, and we don’t want you to start up the country, solving their problems, because it’s going to get worse for us down here,” she said. Ms Griffin and her partner, Barry purchased their home last year from her father. Addressing the minister with tears in his eyes, Ms Griffin’s father Greg said he felt bad after “lumbering” his daughter with a house that is now “worthless”. “I moved house. I’m even thinking about selling my house now again to buy this house again back off of them, and my wife feels the same,” he said. 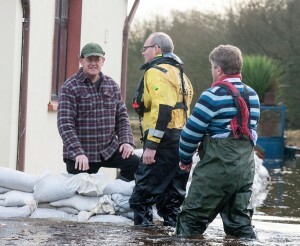 Minister Coveney told the residents the government “has an onus” to help them. “I can assure you you won’t be forgotten about here,” he pledged.